Passed away peacefully, with his loving family by his side, at Lakeridge Health Oshawa on March 25, 2019, at the age of 95. Predeceased by his loving wife of 65 years, Joan (2017). Loving dad of Deborah (Ken), Kathryn (John), Bruce (Paula), and Tracy. BURNETT, John Scott - Passed away suddenly in Oshawa on Monday, March 25, 2019 at the age of 51. Loving brother of Cindy Allen (Gary) and the late Wendy Burnett (Harry). Sadly missed by nieces Cortney Taylor (Karl) and nephews Perry Allen (Pam) and Ryan Allen (Shanna) and great nieces Zoey, Kayla and great nephews Myke, Owen and Evan. 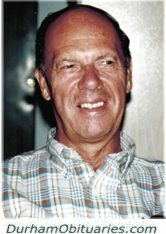 EDWARDS, Donald Harold - Passed away peacefully with family by his side at Victoria Manor in Lindsay on Monday, March 25, 2019 at the age of 84. Beloved husband of Joyce for 64 years. Van MANEN, John Willem - After a lengthy battle with cancer, surrounded by his family, the Lord called home our much loved husband and father John Willem van Manen. He was 71 years old. He will be deeply missed by his wife Theresa, his children Timothy van Manen, Kimberly and Adam DeVries, and Jamie van Manen, and his five grandchildren. Brother of Ina Jeeninga, George Vink, Peter van Manen, Sadie van Manen, Mary and Lammert Huizinga, and Ted van Manen. 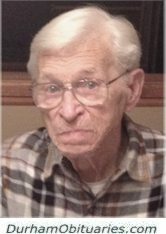 HUGHES, Douglas Andrew - Passed away at Thorntonview Long Term Care Oshawa on Sunday March 24th, 2019 at the age of 86. Dearly loved husband of the late Muriel Scott (2013). Loving father of Ann Hughes of Kingston, Michael Hughes and his wife Ruth of Oshawa, Joseph Hughes and his wife Tracey of Coe Hill. Predeceased by his son William. Dear grandfather of Joseph, Taylor (Josh), Derek and MacKenzie. Great grandfather of 3. 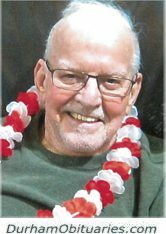 Peacefully passed away on Sunday, March 24, 2019 at his residence in Oshawa. Predeceased by his wife, Rose. Beloved Father to Ken (Katharina) and Paul (Jocelyn). Cherished grandfather to Jacob, Daniel, Emily and Laura. He will be missed by his many friends. Peacefully at Lakeridge Health in Oshawa, Ontario on Saturday March 23, 2019, at the age of 84. Beloved wife of James Dott for 62 years. Loving mother of Lesley and her husband Ken McLeod and Grant and his wife Louise Dott. Devoted Granny to Kimberly (Kevin), Ian (Victoria) and Callum. O'NEILL, Paul O'Neill - Peacefully listening to Frank Sinatra, on Sunday, March 24, 2019, at the Lakeridge Health Centre in Oshawa surrounded by his beloved wife Ruth (nee Trickey), and his loving children Mark, Peter (Manon) and Jane (Daryn Radke). HAYWARD, Daniel John 'Juice' - Suddenly passed away at home on Sunday March 24th, 2019. Loving husband of Sarah Murray. Cherished Dad of Austin Hayward, Joanne Hayward, Ryley Monette, Autumn Wyatt, Kolton Hayward and Jayden Murray. FLAGEL, Kathleen - After a long life filled with love, died peacefully on Sunday, March 24th, 2019, at the West Shore Village in Port Perry, at age 94. Kathleen (nee Maule), dearly loved wife of Carl Flagel. Loving mother of David (Deborah) and Deborah (Peter). 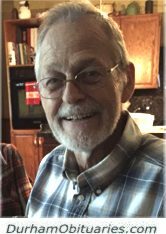 VOSS, William Bill" - Passed at Lakeridge Health Ajax on Sunday, March 24, 2019 at the age of 83. Loved husband to Sue for 57 years. Of Ajax, Ontario, Canada, departed this life in his eighty-fifth year at Lakeridge Health Hospital, Oshawa. He is survived by his wife of almost 63 years, Marion (McNair) Harrison, son Dann Harrison (Jian Wu), Courtice, ON, daughter Sharyn Harrison Wood (John Wood), Brighton, ON, granddaughter Stephanie Harrison (Anthony Fischer), great granddaughter Savannah; and grandson Drew Harrison (Gillian Hood), Oshawa, ON. 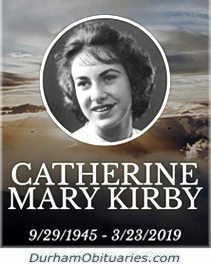 KIRBY, Catherine Mary - Age 73. Passed away peacefully on Saturday March 23, 2019 at Lakeridge Health Oshawa. She was born on September 29th, 1945 in Toronto to Cecilia Laroque and William Culnan. Catherine "Cathy" was a beautiful soul, a loving mother and grandmother. She was a food service hostess at the Paint Plant at G.M. in Oshawa for many years. Everyone at G.M. loved Cathy for her kindness and the generous portions she doled out. MAZZAROLO, Artemio - Peacefully, on Saturday, March 23, 2019, at his home in Blackstock, at age 86. Artemio Mazzarolo, dearly loved husband of the late Anita (nee Garay). Loved father of Heda Mazzarolo, Claudia Mazzarolo, Ives Mazzarolo and his wife Susan, Juliana and her husband Jeff Morgenstern, John Paul Mazzarolo and his wife Beverley and Erman Mazzarolo and his wife Ingrid. 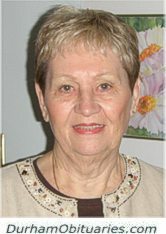 VAN de WIEL, Jeanette Antonia Petronella Elisabeth Maria (née de Leeuw) – Jeanette passed away peacefully into the arm of Jesus in her 101st year on Saturday, March 23rd 2019 at Lakeridge Health Oshawa. Jeanette was born on September 13th 1918 in ‘s-Hertogenbosch, The Netherlands and immigrated to Canada in 1950 with her beloved husband Mathieu Van de Wiel, who passed away in 1971. 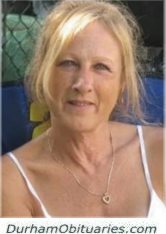 COCKBURN, Elizabeth Martha Marie “Betty” - passed away at Lindsay on Saturday March 23, 2019. Betty (Semple) Cockburn of Lindsay and formerly of Beaverton was the beloved wife of the late Earl Cockburn. It is with profound sadness that we announce the passing of Valerie Ruth Hudson. At the age of 67 surrounded by her family, Valerie returned to her Lord and Saviour after battling a courageous fight with cancer. Valerie was predeceased by her soulmate Rick Walker and her treasured cats Alex and Walker. Loving daughter of David "Stan" (predeceased) and Ruby (Kinney) Perry. Valerie was born on October 21st in Port Maitland, Yarmouth County, Nova Scotia. After a courageous, lengthy illness Taylor is finally at peace. Cherished son of Brian and Dawn. Adored big brother of Jeremy and Liam. Surrounded by family and friends, Norma Bailey (nee Brown) left us on Saturday March 23, 2019 to join her pre-deceased husband William George Thomas Bailey.